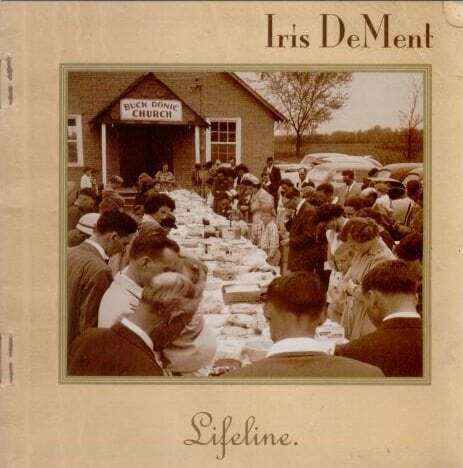 Iris Dement, Lifeline. Though it would be nice to hear some new originals, DeMent stirs a spiritual storm on these old-timey standards. Also: Clive Palmer, All Roads Lead to Land; Mark O’Connor’s Appalachian Waltz Trio, Crossing Bridges. Iris DeMent was born in 1961, but you could be forgiven for thinking her breathtaking new album is a recently uncovered classic from the ’30s or ’40s. or view a PDF here if the link is expired. Iris DeMent begins her first album in eight years by declaring, “I’ve Got That Old-Time Religion in My Heart.” The country-folk singer goes on to prove it on the rest of this supremely moving set of gospel standards and one gospel original. DeMent alternates up-tempo, small-acoustic-combo sing-alongs with more stately, hymnlike numbers that feature her on piano. Singing them all in her industrial-strength twang, she exudes quiet grace and dignity while conveying the feeling that these songs of faith have indeed been a lifeline for her through some tough times. These performances whet the appetite for more original material from this gifted singer-songwriter. Last.” Lifeline is definitely a must buy for any Iris fan. “I’ve Got That Old Time Religion in My Heart”). Arkansas and California as a form of therapy and perhaps even salvation. alone, despairing and playing the songs as a search for some kind of peace. as far as the mid-19th century. Review by Thom Jurek On the surface, Lifeline, Iris Dement’s return to recording after an eight-year hiatus, is a collection of age-old gospel and church tunes from the 19th century  or earlier  in the grand Protestant tradition. He liner notes tell a different story. She recounts how her mother played and sang these songs in times of stress looking straight at the sky, “as if she were talking to someone.” She claims that for her, too, the music contained here became her lifeline through a season of hardship, and that when calling her mother from the road in difficult straits, she was told to get to a piano. Dement’s raw, high lonesome voice is as out of time as the material, though these presentations are not exactly rough-hewn. They are plaintive but polished with accompaniment from a host of players, including Bo Ramsey, Mark Howard, Stu Basore, Stuart Duncan, and others. Dement plays piano on some tracks, guitar on others. For Dement they may indeed represent places of comfort in the midst of despair and desolation, yet for the casual observer, they feel like simply-rendered, distinguished readings of familiar spirituals. Dement goes out of her way to distance herself from the religion spoken of in these pieces, saying in her notes that the songs represent something bigger than that to her, but to the listener they come off as reverent and quaint, hardly the stuff of earthshaking experience. It is only on “Sweet Hour of Prayer,” where Dement accompanies herself on piano, that the notion of shelter from the storm comes through brilliantly and unmistakably. There is one new song here, an original called “He Reached Down” recorded with Ramsey, that reaches the heights of Infamous Angel or “My Life.” The narrative, though biblical, is saturated in Dement’s singular storytelling manner, where her voice reaches into the grain of the material and pulls at its mystery until its emotion and truth become unfettered and fall free. While this is far from a full return to form for Dement, it is truly good to have her back. polls today to vote, drop by the music store. guitarist Bo Ramsey contributes his talents.